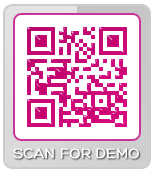 How to use SMS / mobile text engines to enhance QR Code marketing / advertising. SMS / Text engines provide an additional mobile platform for you reach an extended audience. Mobile SMS / Text Engines reside on your server and are powered by the DOTGO® platform. Use SMS to respond to queries by users via text message. Great for updates, contests and more. Image Galleries, Social Media, Audio.